PA leader's spokesman says upcoming UN bid will be a 'crossroad' as Abbas promotes 'three year plan' for 'Palestinian state'. Palestinian Authority president Mahmoud Abbas was to meet Arab diplomats in New York Tuesday ahead of a fresh bid at the United Nations to create a new "political reality," his spokesman said. "This visit is going to be a very important one, a crossroads," Nabil Abu Rudeina told Voice of Palestine radio. "Settlements must stop. Israel must be forced to accept international legitimacy and law," he said. "If it does not, there will be another political reality to deal with. The next few weeks will see developments that will affect the peace process in the future." Since the collapse of US-led peace talks with Israel in April, the PA has been pursuing a new diplomatic path establish a "Palestinian state" via the United Nations and through joining international organizations - in breach of previous agreements with Israel. During the UN General Assembly, which opens Wednesday, Abbas plans to propose a three-year deadline for driving Israel out of Judea and Samaria and establishing a Palestinian state there. He will meet the Arab group "to devise a unified position for making the next move towards establishing a state," Abu Rudeina said. "Things are critical right now, but the Palestinians and Arabs are determined to go to the (UN) Security Council and demand international protection," he told the radio. Speaking to students in New York Monday, Abbas confirmed he would lay out "a new timetable for peace talks." 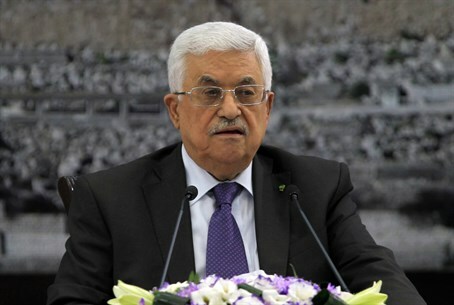 Abbas will meet US Secretary of State John Kerry Wednesday to lay out details of his initiative. "If he rejects it, the leadership has other options. We will go to international agencies and the Security Council," Abu Rudeina warned. But if Abbas's proposal were put to the Security Council, it would likely be vetoed out of hand by the United States as a "unilateral move." Last week, Abbas held talks with French President Francois Hollande, who confirmed that a "solution to the conflict" would be put to the Security Council because years of stop-start negotiations had gone on "too long." "We will have a resolution, to be presented to the Security Council, that will say very clearly what we expect from the (peace) process and what the solution to the conflict must be," Hollande told reporters, without elaborating. In 2012, the PA won the status of a UN observer state. That gives them the ability to become a party to the International Criminal Court, where they could sue Israeli officials over allegations of war crimes - but it could also potentially open the door to similar legal charges against the PA and other Palestinian terrorist groups.